One of the big problems we run into when we talk about the weather is that people underestimate the risk they face when severe storms approach. The "it'll never happen to me" mindset doesn't only apply to heart attacks and car accidents. The odds that any one of us will find ourselves in the path of a tornado is relatively small. But it still could happen. It's instinctive to want to run outside and look around when a tornado warning is issued. You want to see the tornado to internalize the threat and seek safety—unfortunately, by the time you can see the tornado, it's usually too late. Meteorologists have some fantastic tools available to them to detect a tornado many minutes before it hits a location, and an important part of severe weather safety is training ourselves to overcome our instincts and trust the warning that an unseen danger is on its way. Tornadoes were such a sensitive topic in the days before weather radar that meteorologists weren't allowed to publicly mention the word "tornado" for fear of setting off mass panic. After all, tornadoes came by surprise without the technology to detect or predict the storms that produce them. The first successful tornado forecast was issued by meteorologists Ernest Fawbush and Robert Miller at Tinker Air Force Base in Oklahoma City back on March 20, 1948. Fawbush and Miller alerted the commanders at the military installation of the threat three hours before a severe thunderstorm swept across the base and dropped a damaging tornado. Their accurate warning 70 years ago opened the door the advances in tornado forecasting from which we benefit today. Today, tornado watches and warnings are a ubiquitous part of weather forecasting. A tornado watch is a short-term forecast that means conditions are favorable for thunderstorms that could produce tornadoes over the next couple of hours. A tornado warning is issued when meteorologists detect a thunderstorm capable of producing a tornado, or they have evidence that there's a tornado on the ground. It’s easy to confuse a watch and a warning. A watch means you should watch for bad storms, and a warning means you need to act immediately. Tornado warnings are based off of spotter confirmation of a tornado or Doppler weather radar showing strong indications that a tornado is possible or occurring. Most folks see tornado warnings so often—and personally see a tornado so infrequently—that it can become easy to ignore these warnings as just another false alarm. That's a dangerous gamble to make. Meteorologists don't issue tornado warnings for no reason. There's usually good evidence that a tornado is possible or occurring, and it's all thanks to weather radar. Weather radar came into use during World War II when soldiers tasked with tracking enemy aircraft found that their radar was picking up rain in the distance instead. This technology revolutionized our ability to track the weather, keeping tabs on everything from snow showers to tornadic supercells without requiring eyes on the ground to scour the skies. Weather radars kept tabs over most of the United States by the 1960s and these devices have undergone upgrades every couple of decades to keep up with scientific advances of the time. The current generation of radars began service in the early 1990s. 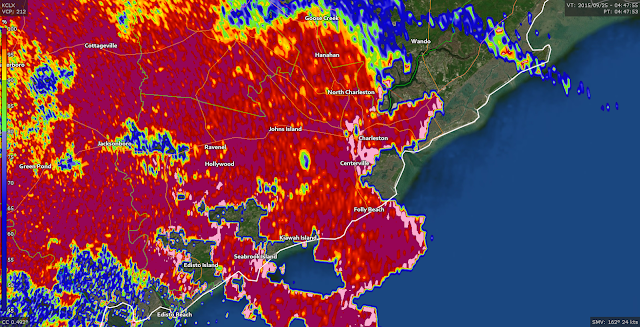 Weather radar up until that point could only see the location and intensity of precipitation. The new technology utilized the Doppler effect to detect the speed and direction of precipitation—by measuring the velocity of raindrops, you can accurately calculate the wind speed within a thunderstorm. This became an enormous help in figuring out which thunderstorms were severe and which storms included rotation that could produce a tornado. Let's look at a tornado that struck near Charleston, South Carolina, in the middle of the night on September 25, 2015. The EF-2 tornado damaged dozens of homes in Johns Island, but advanced warning helped all residents safely avoid injury despite the tornado touching down after midnight. 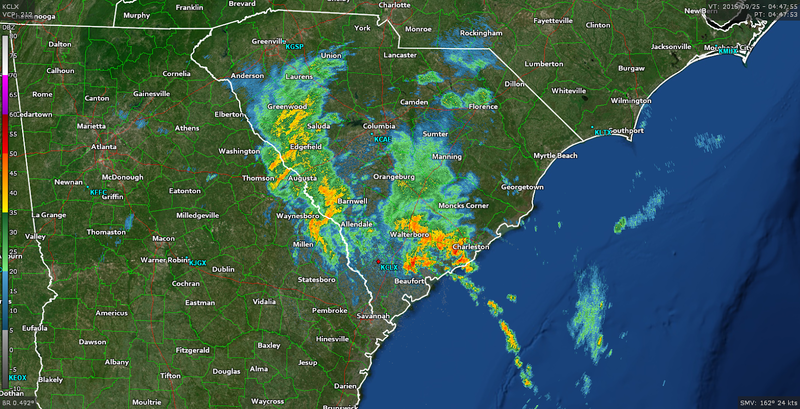 Thunderstorms were in the forecast for the Charleston area that night, but there was no tornado watch in effect and the Storm Prediction Center made no mention of a potential for severe weather the night the tornado touched down. The larger environment wasn't conducive for widespread severe weather. Just the right mix of ingredients came together to allow a thunderstorm coming ashore to turn into a supercell and drop a significant tornado. That tornado would have come as a complete surprise if it weren't for Doppler weather radar. The above image shows the reflectivity image (precipitation) we're so used to seeing on the news or in a weather app. It is possible to see where a tornado might be located in this image if you're experienced in working with radar imagery, but it's not obvious and could easily be overlooked if you're not expecting tornadoes to develop in that kind of an environment. This is where Doppler technology comes into the picture. 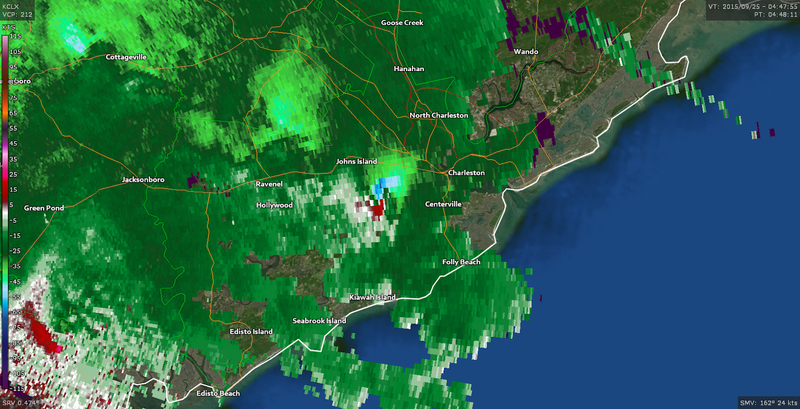 If you look at the winds within the thunderstorm west of Charleston, it paints a much different and much uglier picture of what's going on that night. 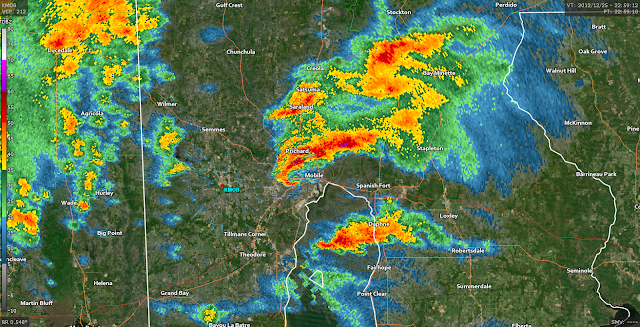 The velocity products generated by radar images are usually displayed as shades of red and green. Green colors depict winds moving toward the radar while red colors indicate winds moving away from the radar. Brighter colors indicate stronger winds. When you have bright green and bright red colors very close together, forming what's known as a couplet, it indicates strong rotation within a thunderstorm. A look at the velocity image just west of Charleston shows a strong couplet approaching Johns Island. Meteorologists issued a tornado warning when they saw this couplet appear on radar, as the data indicated strong rotation that could produce a tornado. The 2010s saw a new radar technology called dual polarization (or "dual-pol") added to our existing network of Doppler weather radars. Radar could already detect the location, intensity, and velocity of precipitation, but adding a second radar beam (hence the "dual" in dual-pol) essentially adds a third dimension to radar data. 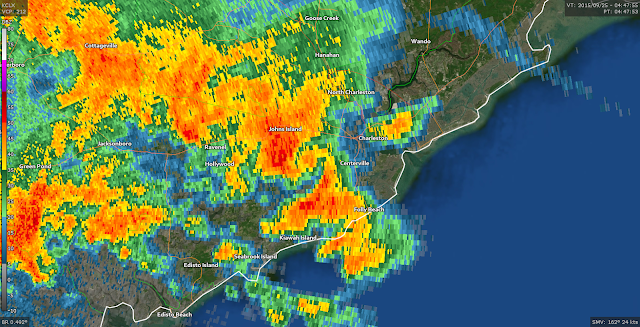 Now you can see both the size and the shape of objects picked up by the radar. This lets you differentiate between raindrops, hailstones, snowflakes, and other objects like birds, bugs, and tornado debris. That last one—tornado debris—marked another significant leap in tornado forecasting. Tornadoes can loft so much debris into the air that weather radar picks it up as intense returns, creating what's known as a "debris ball" on radar imagery. Dual-pol technology allows meteorologists to see this debris more clearly, giving them the chance to warn people that there really is a tornado on the way. This confirmation helps people know that it's the real deal and hopefully gives them the chance to take the warning seriously before it's too late. Debris shows up in dual-pol data with a product called "correlation coefficient" ("CC"), which tells you if the objects on radar are similar in size and shape. Uniformly-shaped objects like raindrops and snowflakes have a correlation coefficient between 90 and 100 percent, while dissimilar objects like a wintry mix of precipitation will have a lower percentage. Tornado debris—including trees, building debris, and vehicles—will have as low of a correlation coefficient as you can register on radar. The tragic mix of debris flying through the air shows up as a conspicuous dark blue splotch on CC imagery, which, when co-located with rotation in a thunderstorm, can be used to confirm the presence of a tornado. All three of the above radar images were taken at the same time. You can see the beginning of debris showing up on CC imagery west of Charleston as the tornado starts lifting debris thousands of feet into the air. Nine minutes after the initial tornado warning was issued, an EF-2 tornado with 130 MPH winds had torn through several neighborhoods and damaged nearly 80 homes. When you look at reflectivity (top-left), velocity (top-right), and correlation coefficient (bottom-left) together, it paints a dire picture of what could have otherwise been a disaster without advanced warning. You'd never see the tornado since it's after midnight and rain-wrapped. Tornadoes weren't in the forecast. There's no obvious sign of a tornado just by looking at the reflectivity image if you didn't know what to look for. Doppler and dual-polarization technology gives meteorologists the tools they need to see a tornado long before you do. When a tornado warning is issued, it's issued for good reason. Don't wait to see a tornado if you're ever under a warning. Trust the warnings and use those precious minutes to get to safety.